Esthwaite, Esthwaite nr. 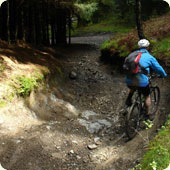 Grizedale, Near Sawrey and Far Sawrey - Cumbrian Trail Guides - Mountain Bike Cumbria - beautiful trails and information from throughout the Lake District and beyond! Starting at the ferry. From the ferry go along the road and when there is a turning to the RIGHT take it. About 1 mile from the turning and after crossing 2 cattle grids, straight after the 2nd cattle grid, turn to the LEFT and continue on the trail up the hill, all the way to the top 3/4 mile. Once you have reached the top, go through the gate, carry on and through another gate and then go further on, go straight ahead and then go through the next gate. Once through all that, start going down the hill, mind out for another gate, carry on through and the descend all the way to the road. Once on the road, turn RIGHT and carry on down past the pub, after the pub there should be a shop (Sawrey Stores), on a lane to the LEFT, if you wish get some goodies there as they are quite good, despite being small. After the shop, return to the main road, you should see a road opposite the shop (going RIGHT off the main road), go up there. If you go along this road, till a cattle grid, once over the cattle grid, take the next LEFT heading towards a ford. Go through the ford and up the hill, till you get to a gate. Open the gate and then go right round the fence to the LEFT, so you are sort off going the way you came, but down another road. Follow the road all the way down, past the farm and down to the main road. Once at the main road, go RIGHT. After "Hill Top", go LEFT down the road to the bottom, until you get to the road. (Some little bits of fun around here). At the Junction go RIGHT and carry on past the fish farm, once past the fish farm, take the next LEFT up the hill, until you see a track to your right, go up the track, all the way to the top, where the FOX is located. Once at the top REST and then return the way you came for some fun downhills. NOTE: if you wish to goto the "Grizedale Visitor Centre". Starting at the fox, go the way which it is facing, down the hill, take the first RIGHT and then the next LEFT to get down to the road, right out side the centre. This trail has been viewed 49675 times!